We’ve all been there. It’s the age old dilemma of how to share your home Wi-Fi network with your guests. Sure, for your own family it’s easy. You tell or text them your secret Wi-Fi password and they’re on. But it gets more complicated with guests, like the babysitter or your overnight guests from Airbnb. Plume’s HomePass™ finally solves the dilemma with secure, customized guest access. Until now Guest Wi-Fi has clumsily evolved into a separate Wi-Fi network with a single password to share with all your guests. 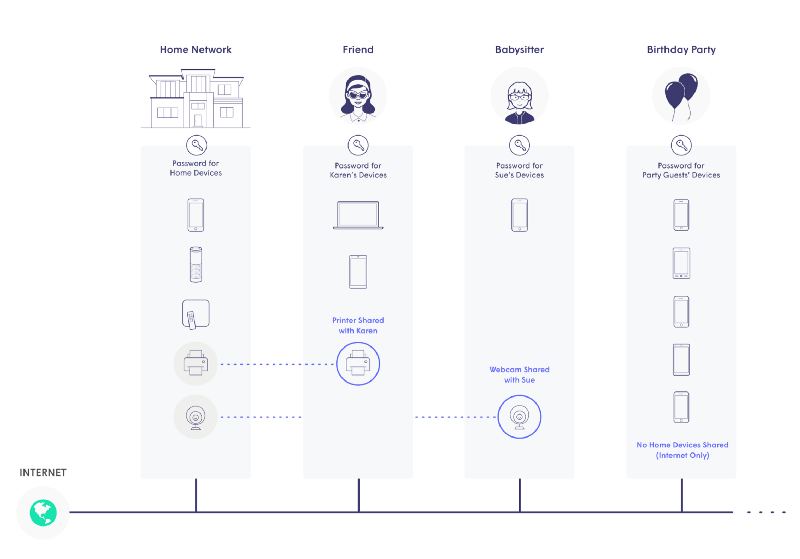 If your guests wanted to play some tunes on your Sonos or print their boarding passes, tough luck, because your separate guest network is firewalled from your home network and giving them access to your printer also means giving them access to your NAS with all of your family pictures. Additionally, once you give out your password to your guest Wi-Fi network, you are no longer secure. Those Wi-Fi passwords get around, and the longer you go without changing the password (how often do you remember to change your guest Wi-Fi credentials, anyway?) and the more people you give it to, the more you are exposed. Controlling and easily share access for your guests with the Plume App. So, why is this more secure than our old Guest Wi-Fi network, and how is it done? Let’s dig into the details. First, it’s not a good idea to give one password to all your guests and let it live on forever. Instead, give each of your guests their own personal password with HomePass™ through the Plume mobile app, and, if needed, set a time for that password to expire and shut off. Second, you decide which devices each of your guests can access, and which they cannot. Plume blocks any attempt to access local devices on the network without permission from you, the host. For example, your old friend should have access to your Plex media server to show their favorite movie, but you can limit your party-goers to only access your TV to show photos from their phone. And neither set of guests get access to your video camera DVR system when you’re not quite sure you remembered to change the default password. 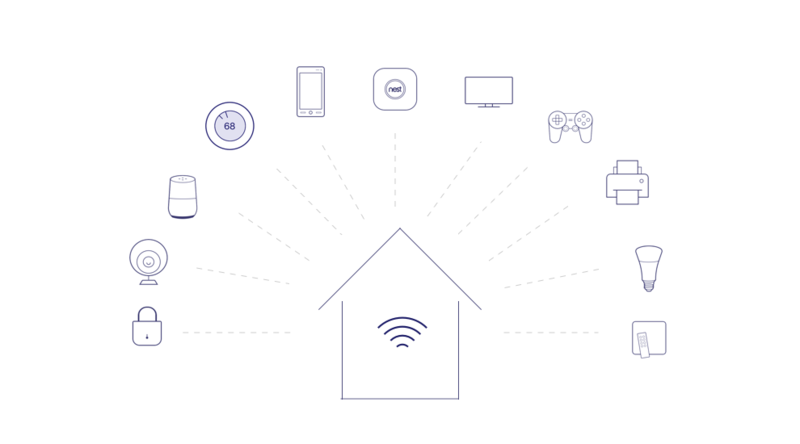 Devices that only connect to the cloud, like Nest Cams, can be shared via their respective apps without the need to share via HomePass™. 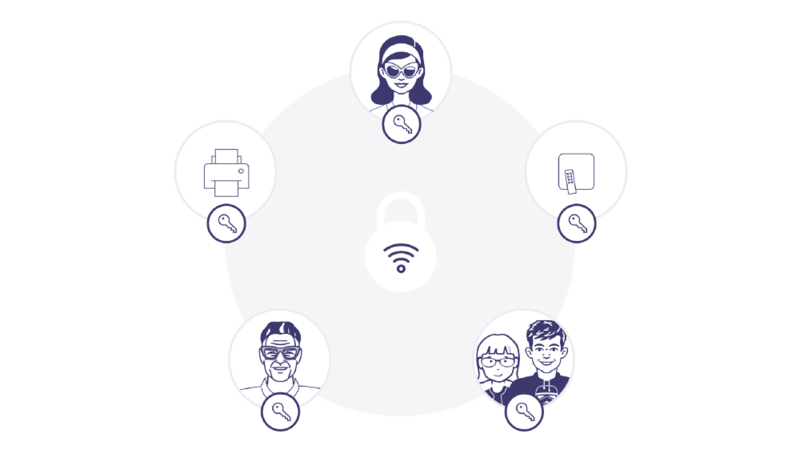 We’ll block all devices by default to avoid any security loophole or hack from allowing guests to gain direct access to turn your device into a bot or send video feeds to unwanted people. Lastly, it’s not always your guests that you need to worry about; it’s the devices you bring into your home. For any devices you want to make sure only access the internet and not your home devices, create a separate internet only password. This is good practice for your new IoT light switches or that work laptop where you’re not quite sure what software is running in the background. Likewise, fully isolate guests you don’t want to have access to your home devices through passwords with internet only access. Let’s nerd out now. Plume strictly blocks all traffic between guests and your home devices at each Pod in the network, unless the destination of the traffic is to the internet or to a shared device you specify for each guest in the Plume App. 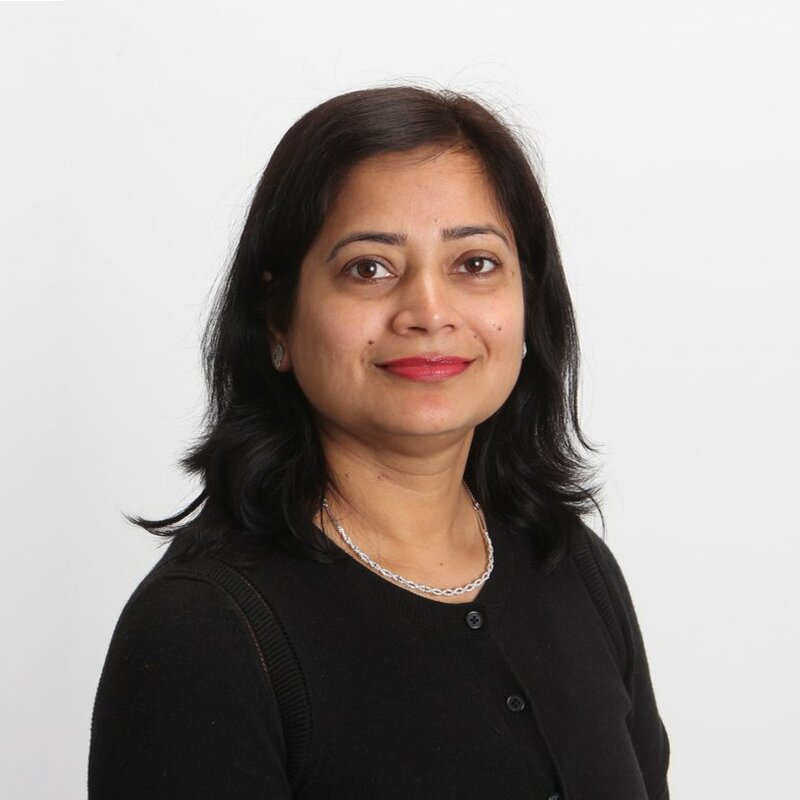 Plume uses a cloud-based Software Defined Network (SDN) architecture to implement this access control, taking advantage of enterprise grade security and filtering rules. 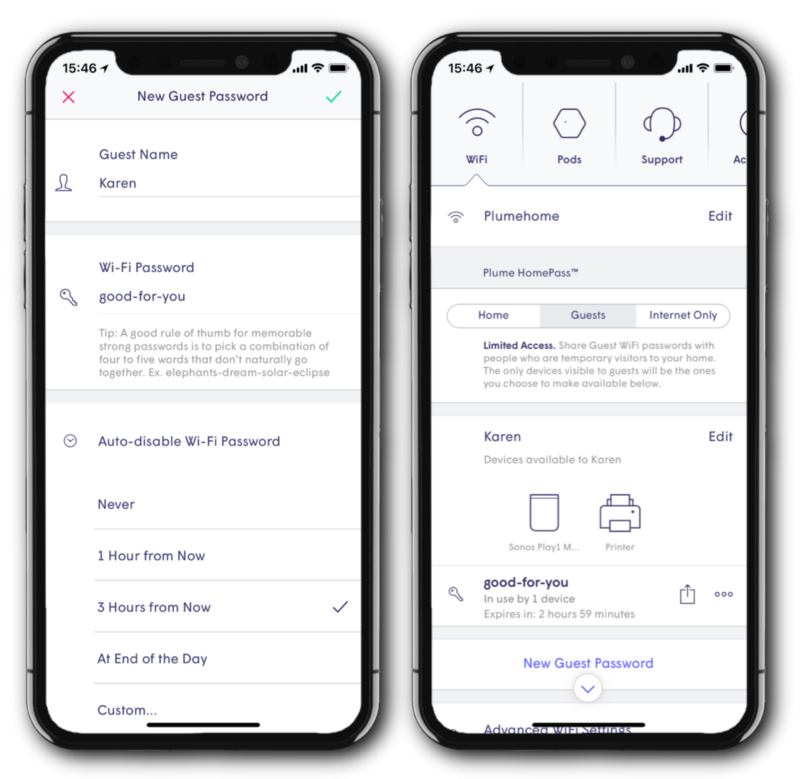 So, say “Goodbye” to the minimal security, separate Guest Networks congesting the Wi-Fi airwaves and take control of your guest access with the visibility and confidence of securely sharing access to your family, friends and visitors from the Plume app with HomePass™.